New research shows Canadians are living longer than ever. With an average life expectancy of 82.2 years, Canada now ranks 12th in the world. 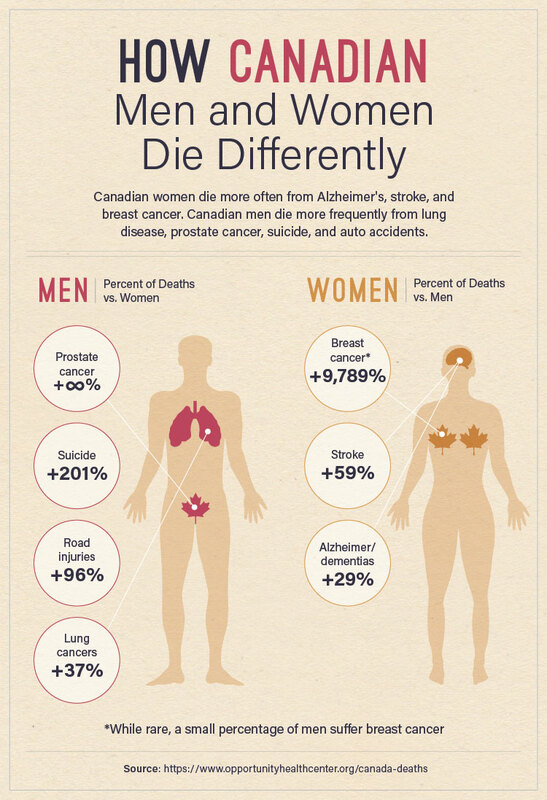 Sadly for men, Canadian women live an average of 3.9 years longer. This means a life expectancy of 80.2 years for men, and 84.1 years for women. Longer lifespans for women are one of the reasons that when it comes to the end of life, Canadian men and women often die of different causes. Recently, researchers at Opportunity Health mined 23 years of data from the Institute for Health Metrics and Evaluation (IHME) to tease out exactly what these differences are. Because women simply live longer, they are much more likely to die of diseases of old age, including stroke and Alzheimer’s. In addition to lifespan, other major contributing factors to the difference in death rates include biology. For example, while men technically have breast tissue-and a handful of men die each year from breast cancer-this is predominantly a disease that afflicts women. Lifestyle factors also contribute. Men are much more likely to die of suicide, road injuries, and lung cancers-all of which have a behavior based component. Here are the top 100 causes of death, ranked in order for Canadian women (the list for men is slightly different.) Each column compares the relative difference between the sexes for each cause of death. If you’re as fascinated as we are by these numbers, check out these charts showing more detail about how Canadians die differently. The study will be run again next year to look for further changes.